TRIO Student Support Services Program Advisor Vanesa Morales (left), Peer Advisor Lawona "LJay" McKenzie (right) at the free taco bar on Nov. 7. Free lunch is available to all CSUN students on select Tuesdays, 12:30 to 2 p.m., and free breakfast on Wednesdays, 9:30 to 11 a.m. in Bayramian Hall 245. Photo by Lee Choo. CSUN students help themselves to free food provided by TRIO Student Support Services in Bayramian Hall 245. Photo by Lee Choo. (L-R) TRIO Student Support Services staff Daniela Barcenas, administrative support; Frank Muniz, director; and Vanesa Morales, program advisor. Photo by Lee Choo. TRIO Student Support Services Director Frank Muniz and Frida Endinjok, student president of CSUN's Food Recovery Network, celebrate the partnership that's helping provide free lunch and breakfast to CSUN students in need. Photo by Lee Choo. After a stressful daily commute from South Los Angeles on the bus, Dezzerie Gonzalez, a sophomore sociology and Chicano/a studies major, often arrived at the Califo​​rnia State University, Northridge campus hungry. Dropping out of college seemed like an easy option for Gonzalez — who was trying to balance family, academics, maintaining a job, paying for tuition and the two-hour commute each way. The oldest of three children, Gonzalez said she also feels responsibility for her two younger sisters. Looking for more resources and support, Gonzalez joined the CSUN TRIO Student Support Services program during her freshmen year, after a referral from her Educational Opportunity Programs (EOP) mentor. TRIO is a federally funded college opportunity program that supports first-generation, low-income students with resources to help them succeed in college. TRIO is a composite of three original programs established by the U.S Department of Education to increase the presence of first-generation students from low-income communities in higher education. 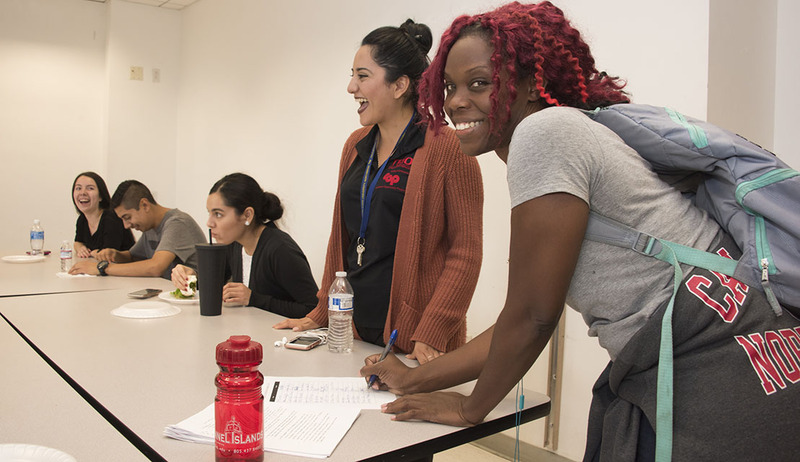 To better aid students facing hunger and stability issues — a growing crisis throughout the California State University system — CSUN’s TRIO Student Support Services program has added free daily meal options and snacks available to all students in need. 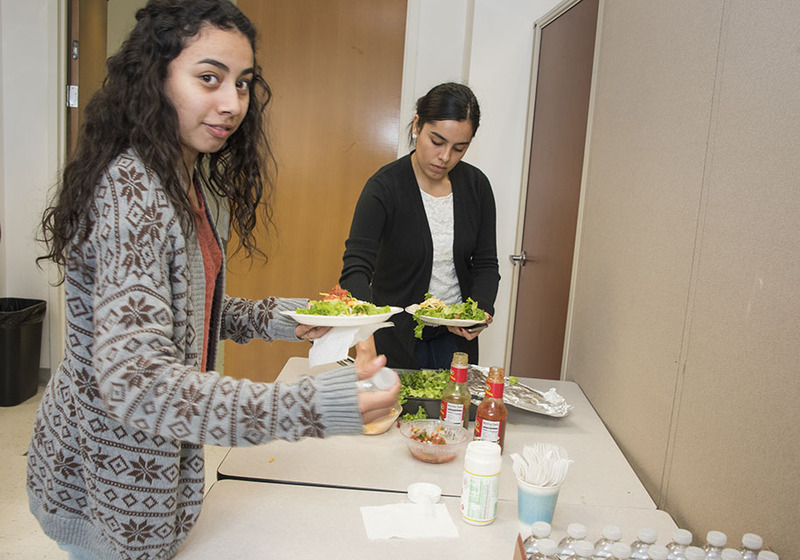 TRIO Student Support Services provides free lunch on select Tuesdays from 12:30 to 2 p.m. and free breakfast options on Wednesdays, 9:30 to 11 a.m. On​ Nov. 7, TRIO hosted its first free taco bar for CSUN students. A recent study reported by the Los Angeles Times noted that 1 in 10 CSU students are struggling with homelessness, and about one in 4 students went hungry during the 2016-17 academic year. The CSUN student support efforts were built on a partnership between TRIO Student Support Services and CSUN’s Food Recovery Network, launched in 2015 by a group of students. TRIO Student Support Services serves more than 140 students each semester. In high school, Gonzalez participated in the TRIO Educational Talent Search program, which helps students in grades 6-12 reach their high school diploma and supports those interested in pursuing higher education. When she was struggling to adapt to college, TRIO Student Support Services quickly became a home away from home for Gonzalez, a first-generation commuter student adjusting to university life. After noticing that some students were attending classes hungry and food was going to waste at various campus dining locations, senior and Sustainability Chair for Associated Students Frida Endinjok and four other students founded CSUN’s Food Recovery Network. Endinjok had joined the TRIO Student Support Services program after transferring to CSUN from Los Angeles Mission College in her junior year. As president of the Food Recovery Network, Endinjok is responsible for maintaining the program’s operations, logistics and partnerships. Network leaders approached Muniz in 2015 with the idea to help students in need. With the partnership up and running, TRIO Student Support Services now provides free lunch and breakfast in Bayramian Hall 245. Lunch options include tacos, spaghetti, hot dogs and other options. Breakfasts include hot coffee, orange juice and a variety of pastries. Free snacks and pastries are also offered throughout the week. All CSUN students are welcome. The food being offered is a collective donation to TRIO Student Support Services and the Food Recovery Network by CSUN organizations such as CSUN Dining, the Freudian Sip and CSUN Food Garden.